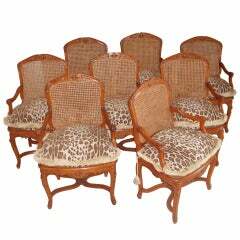 1950s set of eight English bamboo upholstered armchairs. 1970s set of six Spanish bamboo dining chairs. 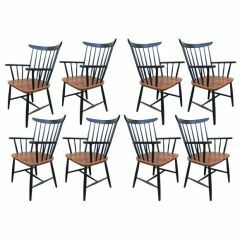 Four chairs and two armchairs. 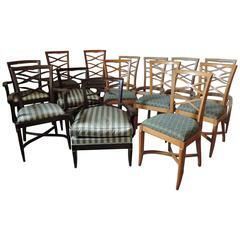 Italian modern design with the original upholstery, colors and geometric shapes. 1970s Spanish set of 6 bamboo chairs with brass fittings. 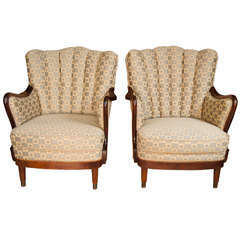 1950s pair of Spanish lace wicker, wood and bamboo armchairs. 1950s newly upholstered grey fabric Retro vintage teak armchair, chair stands on solid teak tappered legs and has lovely shaped triangle shaped armrests.